Built in 6, 9, 10 and 12-inch versions, Atlas lathes were made by the Atlas Press Company, an organisation based originally in Kalamazoo, Michigan, USA. Because they sold in such huge numbers, the most frequently encountered models today are the "10F", a power-cross feed version of the "10-D", and the useful little backgeared and screwcutting 6-inch (3-inch centre height). However, the very early 9-inch and the later more thoroughly developed 12-inch are not uncommon. As the final 12-inch lathe was assembled on the 6th of March, 1981, that gives a production run for the type as a whole, including the first 9-inch models, of almost 50 years. Although Atlas lathes were subjected to continuous detailed improvements, the general appearance of the 10-inch remained substantially unchanged from 1936 until 1957 - and the 6-inch lathe from 1937 until the early 1980s. If you don't recognise your particular Atlas model, explore all the hyper-links above for, besides different sizes of lathe, the company also produced a range of "Utility" and what were called "Unit Plan" models - some without screwcutting and with unguarded belt drives - that can be difficult to categorise. Also produced, though in the UK only during and just after WW2, was a capstan version (screw-machine) a lathe dedicated to production work. In the USA no such version was offered, though it was possible to fit the ordinary machine with a conversion kit - a bed-mounted 6-station capstan unit and a cut-ff (forming) slide. Even in pre-WW2 years Atlas had made novel and economical use of new materials and all models had their changewheels, most other gears, handwheels, pulleys, clasp nuts and other small items made from "ZAMAK". Two of the three copies made in England under the "Sphere" and "Halifax" labels went further and had several parts including the headstock 4-step pulley, changewheel guards and shell of the bed-mounted reversing gearbox made from an early form of a black, engineering-grade plastic. ZAMAK (a registered trade mark) is an alloy of Zinc, Aluminum, MAgnesium, and Kupfer (kupfer is German for copper) pressure injected into hardened-steel dies. It was developed by the New Jersey Zinc Company (based near the Franklin and Sterling Hill mines of northern New Jersey where the zinc ore was extracted) and employed from the very beginning of Atlas lathe production in 1932. The use of ZAMAK would have required a number of expensive dies - and Atlas must have reckoned on selling substantial numbers of machines to recoup their investment. However, one very important advantage of ZAMAK was a surface finish so smooth that the need for machining was often eliminated, leading to a substantial saving in both production time and cost. The mix used to produce ZAMAK has always varied to suit a particular application - for example ZAMAK 5 consists of 4% Aluminium, 1% Copper, 0.05% Magnesium with the rest Zinc - and it is known that Atlas choose to use one of the more durable varieties - even though, due to the higher casting temperatures needed, die life was shortened and costs increased. The ZAMAK process represents one of the shortest paths available between metal raw material and a finished product; it is still widely used today and should not to be confused with "pot metal", a cheap alloy of mainly lead and zinc (often used in the production of toys), that can eventually crumble to dust. Unfortunately, one of the drawbacks of even high-quality ZAMAK is that any contamination at the casting stage will shorten part life and lead, eventually, to failure. Unless post-production testing is carried out on a regular basis this problem will not be picked up until, many years later, examination of identical components (used in the same environment) will show some to be as-new - but others hopelessly weakened. Atlas 10" Model D the original 1936 model with integral "Vertical-type" countershaft drive fastened to the back of the headstock and bed. In this form (apart from power cross feed 10-F introduced a year later) the lathe had reached almost its final evolutionary form and was to continue largely unchanged until 1957 - and the introduction of the heavily revised "12-inch" model. Interestingly, the English versions, Sphere, Halifax and Acorntools, did not just sport different badges but had either the "maker's" name cast into the easily-changed bed foot together with the claim "British Made" (Sphere) or with so few major mechanical differences (Halifax and Acorntools) that they must either have been specially constructed by Atlas, or copied and manufactured under licence in England or, more likely, built up there from a combination of made-in-England parts and original spares. Beginning in the late 1930s, numbers of standard Atlas lathes were imported into the UK by Acorntools (1930) Ltd. with WW2 shipping manifests listing ordinary TV-36 models with individual serial numbers for each machine. The Halifax-badged version did incorporated several significant changes (although they are not evident on all examples): a screwcutting gearbox of the post-1957 type - but fitted to the earlier 10F-type lathe, tumble reverse (like the USA Craftsman model) instead of the leadscrew "reversing gearbox", plastic headstock and countershaft pulleys and a wider cross slide. The Sphere also had the wider cross slide and used plastic not only for the matching headstock and countershaft pulleys but also, on some but not all examples, for the changewheel and headstock covers and even, on some models, for the leadscrew reversing gearbox casing and carriage-traverse handwheel; unlike the Atlas it had only one bolt holding down the tailstock end of the bed, rather on the lines of the Raglan Little John, with which it shares the clasp nuts and a few other minor apron parts - Raglan obviously saving themselves the cost of expensive new dies by adopting the readily-available and inexpensive American components. A variant of the Atlas offered by Acorntools during the 1940s and early 1950s, but not apparently market by Atlas in their home market, was a simple hand-operated capstan. If any reader has an Acorntools, Sphere or Halifax lathe, the writer would be pleased to hear from you. The "B" suffix indicated a flange - essential to stop the bearings working out through the hole in which it fits… For a machine-tool application these bearings might, as fitted by the factory, have been special high-quality units designated by the number "3" to indicate a close-tolerance fit - and also marked with either a dot or the letter "X" to indicate the high spot - so allowing the pair of bearings to be set with the marks in line to ensure the spindle ran as accurately as possible. For a bench lathe the Atlas offered a truly vast turning capacity, while efficient American mass-production methods made the machine available at a very competitive price - and many thousands were sold worldwide. One small problem with the original version of the lathe is the little carriage-feed reversing gearbox at the headstock end of the leadscrew; this contains a mechanism involving ZAMAK bevel gears, all of which fall easy prey to heavy-handed operators. The box is designed to be used while the lathe is running, indeed, the makers claimed that as one of its beneficial features; however, if you wish it to have a long and happy life, press the operating lever firmly in the desired direction, but don't force it. It takes a moment or two for the engagement dogs on the face of the gears to match up and slide into mesh - and sometimes they baulk badly. The box also tends to develop play, and a careful setting-up session, involving shims, has been known to pay dividends. Model numbers can be used to decode the original specification of a lathe: a "V" suffix indicated a vertical countershaft whist the letter "H" showed a horizontal drive system was used; if these letters were combined with a "T", as in TV-36, this showed taper rollers were used in the headstock. Digits after the letter/s indicated the length of the bed, but not the capacity between centres; thus, "TV-48" would have been a vertical-countershaft machine with taper-roller bearings and a 48-inch long bed; the bed lengths of 36", 42", 48" and 54" gave between-centres capacities of: 18", 24", 30" and 36" respectively. After 1947 production costs were cut by simplifying the range: just two beds (42" and 54") were offered, the option of the vertical countershaft was discontinued and (sensibly for this class of machine) roller bearings fitted as standard to the headstock. These lathes were coded TH-42 and TH-54 for changewheel screwcutting and QC-42 and QC-54 when fitted with a quick-change screwcutting gearbox. In the USA large numbers of both the 10-inch 6-inch Atlas lathe were sold by Sears, Roebuck the famous mail-order store and badged using their "Craftsman" name. Sears also sold other small metal-working lathes including the popular 109, and "Craftsman 80" (both made by the separate "AA Company") that are often confused with the entirely different (and greatly superior) Atlas 6-inch. The Atlas Corporation published one of the very best instruction books ever commissioned by a lathe manufacturer, the Manual of Lathe Operation. This gives an exhaustive description of the machine's potential together with numerous screwcutting charts, clear instructions for common turning and other machining operations, diagrams, photographs and much useful general lathe-work advice. Copies, with extra content and reproductions of sales catalogs, are available. Unfortunately non of the 10-inch lathes carried date stamps and production records are unavailable (though a retired employee is reported as giving a production number for the 10-inch lathe of over 500,000 units) and the only way of discovering when a machine was built is to examine the roller bearings in the headstock: each carries an engraved date marking (though front and rear bearings may be some months, or even a year or two apart) and will (if original and not changed, of course) give a good approximation as to when a machine was assembled. Circa 1940 F-10H30 Atlas lathe with the bench-mounted "Horizontal" countershaft and power cross feed. One very useful feature common to all versions of the 9, 10 and 12-inch lathes was the huge number of thread pitches that could be generated - achieved by using a cleverly-designed multi-slot changewheel arm that allowed an almost infinite variety of changewheel arrangements to be set up. Most threads between 4 and 96 t.p.i. could be obtained using just the standard changewheel set of: 2 x 20t, 24t, 32t, 36t, 40t, 44t, 46t, 48t, 52t, 54t, 56t and 3 x 64t (though the gear set supplied may well have varied over the years). When a screwcutting section was added to the handbook - strangely it was missing from the first edition of 1937 though space was provided for it to be added - the bulk of the publication consisted of charts showing how to arrange not only for pitches and feeds but also ways of setting up a vast number wire-winding options. All Atlas 9-inch, 10-inch and 12-inch lathe used changewheels of 16DP with a 14.5-degree pressure angle, a face width of 0.375", a bore of = 0.753 and a "double" keyway 0.1875" wide. The gears are interchangeable across the models to the extend that they fit on the same studs, but the one from the 9-inch have a thinner central boss. Listed for only one year, the Model D was also produced as a simplified version, the Model "E", as part of the Atlas "Unit Plan" system. Following the D came the long-lived, power cross-feed Model F - which had not only a completely redesigned apron but also a leadscrew increased in diameter from 5/8" to 3/4". Immediately before the introduction of the F the opportunity was taken to redesign and significantly improve the top slide assembly, the base casting of which had originally been in ZAMAK, a material unsuited to the strains of being fastened by two T bolts into a circular T slot cut into the top face of the cross slide (the front retaining bolt can be seen in the picture above). As the base casting was tightened down - and almost certainly exacerbated by taking heavy cuts - the casting distorted and caused the slide to bind. Atlas solved the problem by switching to cast iron and incorporating a stout post, cast as part of the cross slide, over which the top slide dropped. Square-headed bolts, passing through the lower of the two top-slide castings, pushed short, bevelled-ended bars against an inverted conical face on the post and so drew it down tightly. After WW2 the English Raglan lathe employed an exact copy of this design - a feature that was to prove robust and entirely trouble-free. Strangely, one omission from the extensive Atlas accessory range was a full-length T-slotted cross slide, a fitting common for many years on most small British lathes and one that greatly enhances their versatility. If you would like a T-slotted cross slide for your Atlas lathes.co.uk sometimes have them available. Illustrated below, the first 10-inch (10.25" x 24.5") Atlas lathe was introduced during 1934; the machine was considerably more robust than the two-year old Series-9 it replaced, especially in the area of the headstock where a completely redesigned casting resulted in a much stiffer structure. Bolted to the back of the headstock was a conventional backgear assembly and this, in conjunction with a two-step pulley drive from motor to countershaft, gave 16 speeds that spanned a handy 28 to 2072 r.p.m. In general appearance the rest of the machine did not differ greatly from the original model - and a further two years were to pass before the next revision, the "Model D" of 1936, addressed many of the machine's remaining weaknesses (the designation "D" does not appear in the catalogs but was used on the lathe's cast parts and has become a shorthand way of referring to this model). After the introduction of very successful Model F in 1937 (the "F" was a proper catalog listing) no significant changes were made until the arrival, in 1947, of the quick-change screwcutting gearbox versions QC42 and QC54 . Enormously improved in almost every area the Model D lathe had long, stiffening bed feet, the saddle was given arms that tapered in thickness towards the outside edges, the compound slide redesigned on more robust lines and the compound slides fitted with zeroing micrometer dials. The headstock was further stiffened and the tailstock, strengthened and redesigned so as to "reach" further over the carriage, was provided with a "dip oiler" (often holding poisonous white lead) to lubricate the back centre. The changewheel cover, now in cast aluminium (or plastic when constructed in the UK) was held fast by a spring-loaded catch and some versions, especially those intended for use in educational and training establishments, were available with complete guarding of the drive belts. The swing of the lathe was 101/4" and between-centres' capacities of 18", 24" , 30" and 36" were all available. 16 spindle speeds were provided, from approximately 28 to 2072 rpm, depending on the motor used. The spindle was bored through 25/32", held a 3 Morse taper centre and was provided with a useful 60 hole, plunger-locked indexing device; the tailstock was No. 2 Morse. Because the backgear assembly was bolted to the back of the headstock this allowed the machine to be offered without them in simpler "utility" versions at a lower price. Two designs of countershaft were offered, both with (screw-down) grease-cup lubricated Hyatt roller bearings held within simple but ingenious-designed self-aligning housings: the "Horizontal" bolted to the bench at the back of the lathe (and made the whole assembly rather deep front to back) whilst the "Vertical" was attached to the back of the bed and headstock and made a much more compact and portable unit. As offered in standard form the vertical type was not fitted with a belt-run guard (but individual guards were fitted to the backgears) whilst the horizontal type leant itself more readily to a simple guard that covered just the front run of the headstock belt. However, at considerable expense, an all-enveloping "safety" enclosure that appealed to schools and other training establishments was available for both the vertical and horizontal countershafts. Whilst the plain-bearing models are relatively easy to dismantle for a change of V-belt, the roller bearing models require the complete dismantling of the headstock. In the latter case (to save time and avoid damaging bearings) it is almost certainly better to use an industrial link belt of the T-link type. Atlas catalogues contain a wealth of interesting data: Unfortunately, it appears that the company issued them (until 1939) numbered in chronological sequence, not by product, meaning that the first lathes sales folder was numbered No. 5, the second No. 8 and the third No. 15 - the gaps being filled with literature for their other lines. If any reader has catalogs other than those shown here the writer would be very interested to hear from you..
First Atlas Series-10 lathe circa 1934; the model shown is the 42-inch bed version. Considerably more robust than the original Series-9, this model was significantly improved in the area of the headstock where a completely redesigned casting resulted in a much stiffer structure. A conventional backgear assembly was bolted to the back of the headstock and the spindle-speed range, with a two-step pulley on the motor and countershaft, was a very useful 28 to 2072 r.p.m. "Unit Plan" Models 10A, 10B and 10C with a less-generous specification were also available; the least well equipped, the 1042A, being supplied as a bed with a 4-speed headstock, tailstock and a simple compound slide. The 1042B added a complete 8-speed countershaft unit and motor while the 1042C included the saddle, apron and compound slide rest from the fully-specified 1042 but with only a rack feed for the carriage traverse. 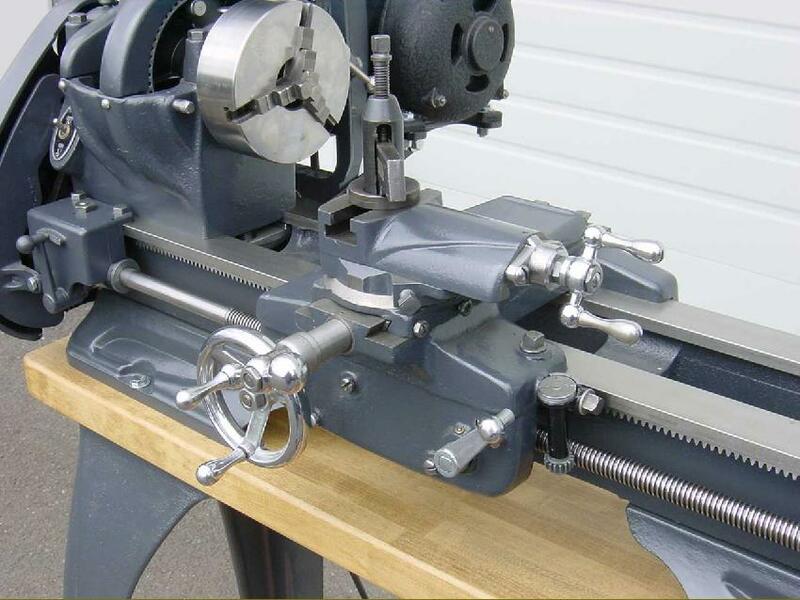 In addition, after buying the lathe, it was possible, as funds permitted, to purchase and retro fit all the other components, leadscrew and backgear, etc., in order to improve the lathe's functionality. In later catalogs these basic lathes, with the same specifications but with major changes updated in line with the fully-equipped model, were listed as Unit Plan Models 10A, 10B, 10C, 10D and 10E. Various bed lengths were also listed, the last two digits indicating the length in inches i.e. 1036, 1048 and 1054. The next stage in the model's steady evolution came in 1936 with the introduction of the famous Series 10D and 10F - shown in regular production form at the top of this page and as an early "interim" version, below. This model was a significant upgrade both in terms of general strength, detailed improvements and overall functionality and was to retain its main components largely unchanged (apart from the introduction of power cross feed and an improved arrangement of top and cross slides) until 1957 and the introduction of the Series 3000 models.. Listed for only 12 months during 1936-37 the Model D was (with a simplified version - the Model "E" - as part of the Atlas "Unit Plan" system) an interim model that appeared just before the long-lived power cross-feed Model F. The main change incorporated in the D was to the top slide assembly, the base casting of which had originally been in ZAMAK, a material unsuited to the strains of being fastened by two T bolts into a circular T slot cut into the top face of the cross slide. As the base casting was tightened down - and almost certainly exacerbated by taking heavy cuts - the casting distorted and caused the slide to bind. Atlas solved the problem by casting a stout post integral with the cross slide over which the top slide dropped. Two square-headed bolts (the front one can be seen in the illustration above), passed though through the lower of the two top slide castings and pushed short bevelled-ended bars against an inverted conical face on the post and so drew the assembly down tightly. With just the post being squeezed the distortion to the cross slide was eliminated. Note the bed feet: the model immediately before this was without the inward splay to the castings. The "plain" headstock, supplied as standard on the early lathes, used a "babbit" or "white-metal" bearing, similar in many respects to the type used on the crankshafts of I/C engines before the introduction of replaceable "Thinwall" shell bearings. The plain-bearing headstock lathes, when properly set up, often give a better surface finish than the roller bearing models but, if the bearings are worn, replacement is both difficult and expensive. This potentially troublesome mechanism is clamped to the bed at the headstock end of the leadscrew. The sliding sleeve, together with its engagement "dogs", is clearly visible. General arrangement of the original 10" Atlas (circa 1934 - 1960) headstock. The 60 indexing holes are visible on the front face of the bull wheel whilst the locating pin can be seen protruding through the front of the headstock casting. This headstock is fitted with "babbit" plain bearings, an option that had disappeared from the catalogs by 1952, and a separate "bolt-on" backgear assembly. Atlas 10" Saddle, apron and compound slide assembly as used on early versions of the Model F with power cross feed. As on all versions of the lathe, the cross slide was rather short - a feature that tended to wear just the middle section of its ways - and had no T slots. In the UK several owners have taken the optional-extra "long" cross slide from a Myford ML7 and fitted that instead. The conversion does require some machining: the dovetail on the thicker side of the slide has to be cut back for around 1/4-inch and the saddle likewise narrowed by taking little from each side of the cross-slide ways. Early through to late-type power cross feed apron. Of very light, single-sided cast-iron construction, and using ZAMAK for almost all other parts, the apron was remarkable for providing power cross feed with a minimum of components. The leadscrew on the power-feed Model F was increased in diameter to 3/4" from the 5/8" of the original Model D. Note the use of cheap square nuts to retain the rack-feed unit. Feeds (Left or Right) per revolution of spindle: 0.0078", 0.0069", 0.0063", 0.0057", 0.0055", 0.0052", 0.0048", 0.0044", 0.0042"
Tailstock set-over, forward or back: 3/4"
Feed screw collar graduations: O to 0.1" by 0,001"
Top slide (tool post) travel: 21/4"
Built-in motor control switch: 10 Ampere for single-phase current only - 3-phase switch extra. Standard specification: automatic, reversible power cross and longitudinal feeds. 6" faceplate; two 60' lathe centers; reducing sleeve for headstock center; combination multi-purpose wrench, wrenches for socket-head screws; instruction book - Atlas "Manual of Lathe Operation". With the Second World War a year-and-a-half old for the British (but yet to start for the Americans) this shipping ticket for 23rd April, 1941 lists a 36-inch bed Timken taper-roller bearing equipped Atlas 10F lathe Serial No. 024444 ordered by the Acorn Machine Tool Company. Did it reach the UK - or is it at the bottom of the Atlantic ?